Where Does the Paper Go? With all the planning involved in implementing an EHR, from choosing a vendor to developing transition processes and redesigning workflows, the switch from paper to digital may seem like a finish line—and in many ways it is. Along with better patient care and better communication among providers, going paperless increases efficiency and decreases the need for storage space. However, eliminating paper workflows doesn’t make the old paper records disappear. As a result, facilities need to plan for managing those records long after the EHR go-live date. Mercy Health System is a multicenter healthcare provider headquartered in Conshohocken, Pennsylvania, with facilities in Philadelphia and its suburbs. The health system has four acute care hospitals, 44 physician practices, a home health care program, and Mercy LIFE, a program of all-inclusive care for the elderly. In 2007, although some of Mercy’s data, such as lab results, medication records, and nursing documentation from the home care program, were already available electronically, the facility decided to implement a broader EHR. To make the transition more manageable, a phased rollout approach was selected. Beginning with the various emergency departments in 2008 and then moving to Mercy LIFE, outpatient practices, and inpatient facilities, Mercy electronically linked its entire healthcare organization. When inpatient physician documentation comes online in 2013, the health system will have reached a significant milestone. “As soon as we get documentation up on the inpatient side, we will be completely paperless from a charting perspective,” says Christine Brutschea, Mercy’s chief information officer. But that doesn’t mean there will be mass bonfires at Mercy’s facilities. The paper record is still the legal record and subject to all applicable retention requirements. And because scanning all paper records into the EHR is impractical and unnecessary, there are times when clinicians will need to refer to the paper record. Deciding what to include in the EHR was a lengthy process. Each hospital department, as well as the outpatient centers and physician practices, has different data needs that must be met. With more than 45,000 charts in Mercy’s physician practices alone, each averaging between 20 and 120 pages depending on whether the practice is a specialty practice or a primary care office, putting everything into an electronic chart wasn’t an option. A clinical committee composed of various disciplines determined what information, such as patient history and current medications, would be necessary for chart start-up. Physician groups from each specialty then made a list of data elements to be included and set time windows for those elements. After discussing these parameters, Mercy’s chief medical officers made the final decisions. 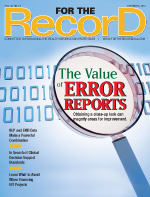 The health system hired a third-party vendor to scan and abstract the chosen pages into the EHR. The abstracting was performed by clinical staff and checked by a physician before being loaded into the system. For the outpatient practices, Mercy initially tried adding patient information as patients came into the office, but that proved to be difficult because any patient whose information isn’t in the system is treated like a new patient. To avoid the workflow problems caused by cancellations and walk-ins, Mercy prepopulated the EHR. If additional items, such as result reports, need to be scanned, the practices can add them to the EHR. The paper records are stored on site so clinicians can access them if they need information that’s not in the EHR, which happens infrequently. Brutschea says some consideration was given to building a database with a query feature around the scanned information that’s not in the charts, but the demand for such a service hasn’t been enough to justify the cost. If demand rises in the future, she says, the idea may be revisited. On the inpatient side, some paper records were scanned and abstracted, and any paper that is generated is scanned concurrently with the patient visit. Information from clinical systems is used to populate the EHR whenever possible. In addition to eliminating paper, clinical systems have the advantage of storing data in a searchable format, which makes trending lab results and other data comparisons much easier; scanned paper forms have to be viewed side by side. However, because the paper records are still considered the legal documents, they will need to be stored for the foreseeable future. Before the EHR, some were stored off site but now they are housed in the medical record departments of their respective hospitals and physician practices. Brutschea says they will reside there for the foreseeable future.